Personally, I think that present generation hasn't got it easy...it's by no means easy to be a teenager nowadays. I really do feel for all the kids and teenagers growing up right now. It is so easy to generalize...just about 15 minutes while running into a friend who has teenage children, I was really impressed what he said (in reply to my husband's saying that teenagers today can't be told what to do)---about how kids/young today are behaving better than they used to. I think it is dreadful when people assume the worst about the newer generation for what is there to believe in if not in the young? It is equally bad when they generalize and talk about the death of feminism...something along the lines that what women really want is Mr. Grey. Really, it is easy to play Freud and generalize... and it is significantly harder to take the effort and see the bigger picture. How wonderful there are such outspoken woman like yourself to prove them otherwise...I do like both the portrait and the message. Such a powerful photograph! It is perfect for today. 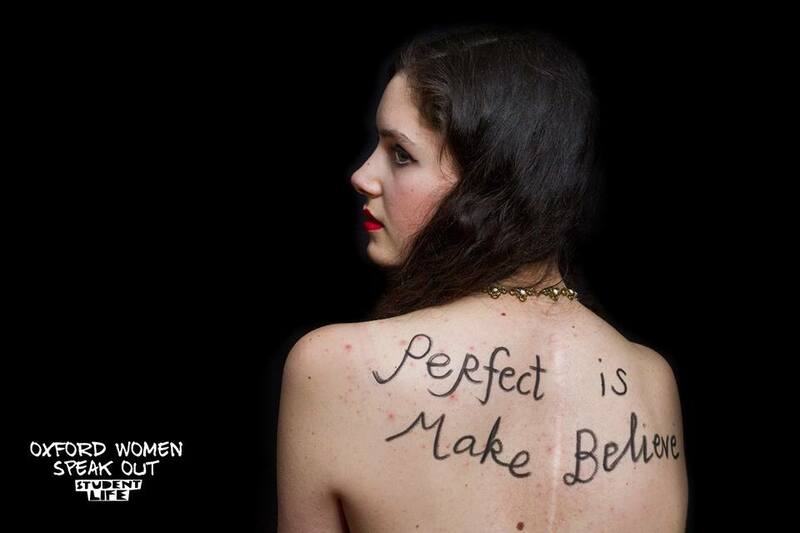 We must stop and wonder at what we as women see as perfection, because it is us women that are often hard on one another and on ourselves...and we must change that. Very inspiring and enlightening post. I am so pleased to see more and more youth to celebrate women, intellect, and change. It's very true that there is a big difference growing up as a teen today, than when I was growing up.. but I reckon there are benefits with social media and more technology in existence. I love what Tavi,Julie, and Gemma is doing, and what a great video. Happy international women's Day to you! You have introduced me to so many wonderful girls and young women with messages of empowerment. I like the message you've chosen for your photo. Powerful. This portrait is so beautiful in itself...and those words (on that particular part of your body) make the image stronger and more real. Be the lovely woman you are. Always. Whenever I feel fear for the future, I am always inspired by the growing handful of amazing, wise young things I run into. There seems to be two camps of young things: those who avoid the world and those who intend to change it. The avoiders are rather good at parties, I must say, but not always the best in a conversation, determined as an ostrich to stay clueless about world events. But then, the star shine of of an indigo kid who just KNOWS stuff, and then spends their time filling their heads with knowing more, and keeping their hearts soft towards their fellow creatures, humans and otherwise. It gives me shivers of hope when I run across the latter- they will have the final say, I think, on whether or not our species goes down in history as plague or healer. You are one such bright light in my estimation. And lovely portrait done up of you. xo.